Sleep is a dynamic process that adjusts to the body’s needs every day. What time you fall asleep, how long you sleep, and how well you sleep all result from the combined effects of two forces: the homeostatic debt and the phase of your circadian rhythm. Individuals of course differ as to what time they go to bed and how much sleep they need to function well, but on the whole, the characteristics of sleep can be regarded as the result of complex interactions between two processes. The first of these processes is called homeostatic debt, which increases as a function of how long you have been awake and decreases as you sleep. The process is somewhat like the sand accumulating in one end of an hourglass and having to be emptied into the other after a certain time. In other words, the longer you stay awake, the greater the pressure you will feel to go to sleep. This process of homeostatic debt, or sleep debt, also explains why, if you stay up all night, then the next night, not only will you sleep longer, but your percentage of deep sleep will be higher. The second process that greatly influences the onset, duration, and quality of your sleep is the phase of your circadian rhythm. This phase is governed by your biological clock, whose rhythm is endogenous but is reset regularly by daylight. 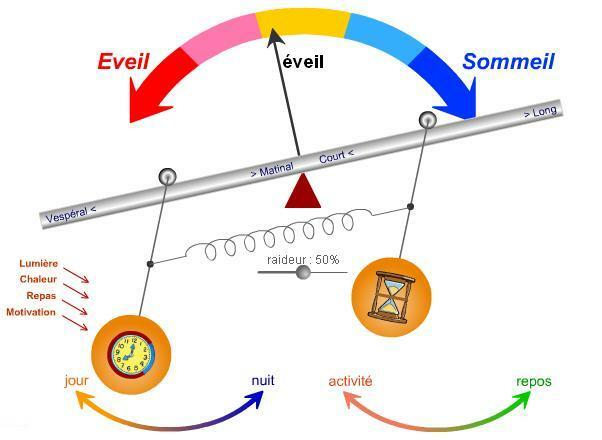 This clock therefore produces a cycle lasting about 24 hours during which the optimal times for falling asleep, dreaming, waking up, and doing work occur over the course of each day. Thus your entire sleep-wake cycle operates as if your circadian oscillator made falling asleep easier at certain times of day, making you appreciably sleepier from 1:00 PM to 4:00 PM, and even sleepier from 2:00 AM to 5:00 AM. These patterns are confirmed by the statistics on workplace and highway accidents. This two-process model for regulating sleep can be diagrammed as a double pendulum. Under normal circumstances, your periods of activity and rest are in phase with the alternation of day and night—your “circadian” pendulum and your “homeostatic” pendulum are in synch, you sleep well when you fall asleep, and you function well when you wake up. But when this relationship is disturbed and the two pendulums are no longer in phase, then the quality both of your sleep and of your performance when awake deteriorate significantly. The peaks of activity for several circadian markers occur at inconvenient times in the sleep-wake cycle, which is the source of the problems caused by jet lag and by working night shifts.